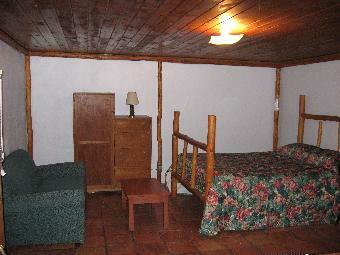 Cabin 4 is a delightful combination of dark wood hand made furniture and fixtures with light blue adobe interior walls. 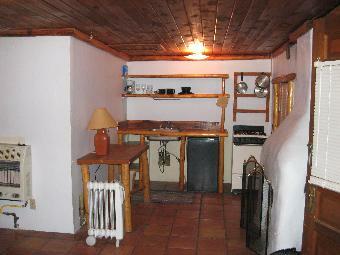 It has a fully outfitted kitchen with microwave, short fridge and gas stove. 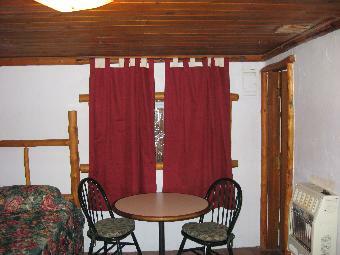 There is a fireplace, queen bed, 3/4 bath, table for two and a fold out sleeper loveseat. It also has a two door entrance with foyer closet in between and it has gas as well as electric heat.